The first of a mini-series of blog posts on cycling injuries with Bespoke's Head of bike Fitting, Ben Hallam and resident Osteopath with New Body Osteopathy, Charlotte Mead focuses on hip pain, how you get it, how to fix it, and how to stop it coming back. All these injuries can be treated and managed by osteopathic treatment, but if the cause is the bad fit of your bike then the only way to prevent recurrence is to correct this. Ben states "the body is adaptable and the bike is adjustable"; this can work to be of both benefit and detriment depending on the fit of your bike. Osteopathic treatment for these conditions varies depending on the cause but will comprise of hands on treatment including joint manipulation to improve range of movement, as well as massage and stretching to lengthen affected muscles and boost circulation. Charlotte may also prescribe specific exercises and stretches to lengthen and strengthen certain key muscles to support your recovery. She may also examine and treat other areas of the body which could be contributing to your discomfort. Meanwhile, Ben and the Bespoke fitting team would set to work investigating and improving the fit of your bike. Ben explains that "Changes to the bike position would not typically solve the underlying problem but modifications can be made to the bike to temporally minimise the impact of these problems. Tightness in the hip flexor complex often leads to an anterior rotation of the pelvis (hips tipping forward). This leads to a decrease in the range of motion in the hip over the top of the pedal stroke. If this is causing impingement or tendinopathy, adjusting the saddle height up and forward in addition to raising the bars will reduce how far you come into hip flexion over the top of the pedal stroke. Piriformis is an external hip rotator and will often cause the foot to not sit straight on the pedal. Adjustment needs to happen at the cleat to initially mirror this. A bike fit is a snap shot in time and as these issues are resolved, the fit should be readdressed to evolve with the body." This holistic approach of treating body and bike creates conditions for the best possible outcome to resolve your injury, prevent recurrence and improve your overall performance. Medically known as hip flexor tendinopathy, snapping hip syndrome comes can be painful or non-painful. Non-painful does not require treatment. 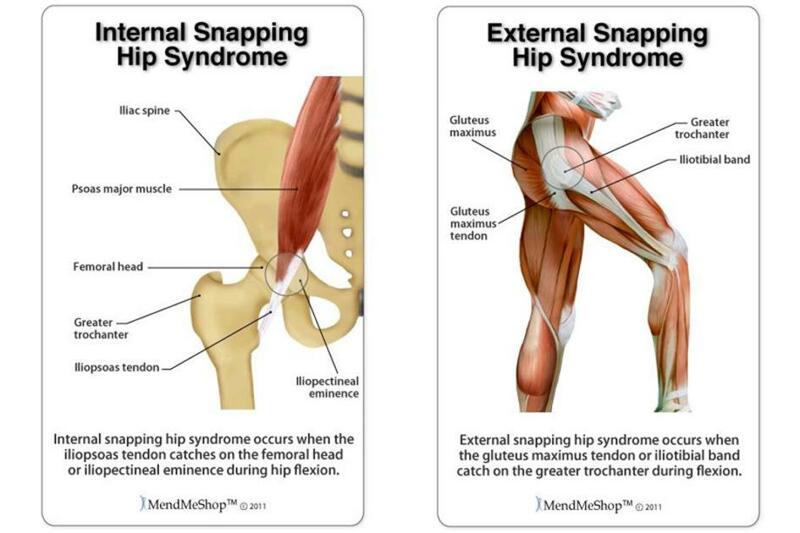 Painful snapping hip syndrome comes in 2 forms - internal or external. Once the diagnosis has been made, work can begin. For internal snapping, an intensive stretching program focused on the lower back and hip is recommended. Modification of training to exclude or limit painful activities is important, and painkilling or anti-inflammatory medication may be sought from your doctor if needed. Core strengthening can be helpful. For external snapping, modification of training and treatment of inflammation are key. Strengthening your abductors and the foam roller may be very helpful in decreasing the snapping. As part of your treatment, Charlotte may recommend the following stretches. Lie on your back and Cross the foot of the affected hip over the opposite knee. Clasp your hands behind your thigh. Pull your thigh toward you until you feel the stretch in your hip and buttocks. Hold for 30 seconds. For more information or advice on any symptoms you may have call 0207 177 0207 or visit www.newbodyosteo.com . To book your Bike Fit call Bespoke on: 0207 7961263 today.